Someone asked me today if I was having a dry January. I think I may actually have recoiled in horror at the very thought of it. Hell no! January is one of the darkest and most dreary months of the year; everyone is fairly miserable because they're back to work after a nice break over Christmas. Why the hell would anyone think that this was a good time of year to be giving up anything, nevermind the sweet consolations of alcohol? But of course, that's exactly what loads of people do every New Year: give up drinking, give up smoking, join a gym, start eating more healthily.... good luck to them, I say. Then I thought about it: I barely actually drink at all and I don't especially like being drunk. I enjoy beer but drink perhaps four pints a week, maybe five. I also quite like wine, but I've still got a bottle open in the kitchen that I started drinking at the beginning of December. I actually don't drink during the week at all. Compared to some, I'm practically teetotal. In fact, to hell with it: I'm going to have a beer right now. On a Thursday night and everything. I'll use it to wash down my kale salad with pistachios, olives, dried cherries, argan oil and just a tiny amount of apple cider. Yeah, the first thing that jumped out at me about her schedule was the shower before the run/workout. The second thing that stood out to me is that she hasn't seemed to factor in her commute to the office. 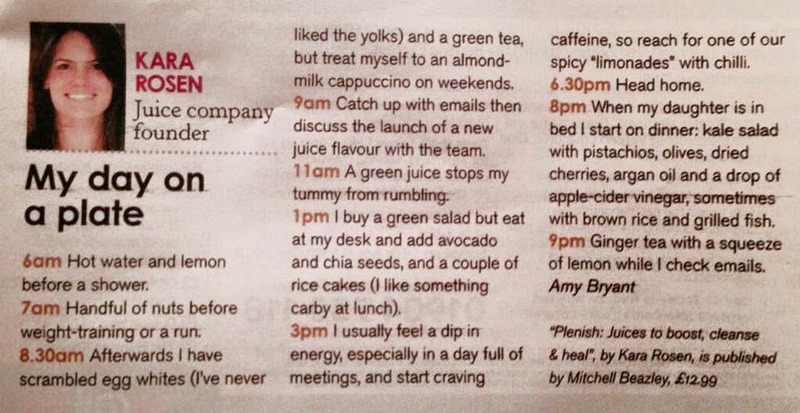 She has breakfast at 8:30, then is catching up on emails & discussing juice flavors with employees at 9. At first I thought she worked from home, but she lists "6:30pm Head home." I had a Delerium Tremems christmas beer and it was delicious. Dan - I don't trust anyone who claims that a green tea keeps off the hunger pangs.... for two hours. There's no way that's her actual diet. I pity her kid.